Twenty-five years ago, Dr Bruce Syme, a young veterinarian fresh out of university, developed a new raw food-based diet in response to the epidemic proportions of skin diseases and allergies presenting in cats and dogs. Determined to take a holistic approach he relocated his pet food business and set up his own practice in central Victoria. Today Vets All Natural products can be found on pet supply shelves in multiple countries. Catching up with Bruce for a coffee at Guildford on his day off, we reminisced about how much has changed since 1999 when I drove out into the bush to interview him the first time. Having just moved from Melbourne to start his own practice in a more receptive community, he had rented rooms behind a dog kennel business at Muckleford, a rural community between Castlemaine and Maldon. It was quite a challenging mud map I had to draw for the photographer to find him later that week with a creek crossing being the major landmark. I remember writing that Bruce was ‘a new breed of vet with a passion.’ His focus was on keeping pets healthy instead of treating the disease. That hasn’t changed but much else has. For a start we are both older and wiser, the single vet practice has grown significantly, and there are now many more competitor brands on the shelves of retail outlets emulating the Vets All Natural products. When it came to finances, in the early days Bruce admits that he was a novice. ‘I wasn’t financially motivated. If there was money in the bank I thought that things were going good.’ His sounding board was a best friend who had studied commerce. As a young vet still with a student debt, the banks weren’t interested when he first approached them to set up his own business. His father provided a loan which Bruce is quick to clarify has been repaid including interest. Bruce surmises that there were three trigger points that forced him to study his business finances more closely. Starting a family at the same time he bought the Castlemaine practice in 2000 was the first trigger point, both bringing with them more financial responsibilities. Second was the realisation that his pet-food manufacturing business was creating 80 percent of his income from a 20 percent output. ‘I started paying more interest then,’ he says. And, lastly taking out a $1 million loan to build a new home for the growing practice with a fully equipped veterinary hospital in 2014. ‘I knew I couldn’t muck around anymore,’ says Bruce who took on a business mentor and coach and signed up for a business management course. While it was important to understand his businesses Bruce also found it frustrating that ‘best practice’ as prescribed by the expert trainers was focussed on getting maximum profit. ‘My ethics are not very profitable,’ he admits. ‘There is this horrible thing called integrity and emotional health.’ While many vets are now refusing to visit properties for large animals because it is not profitable, Bruce believes it is part of their community service and he gets to enjoy the beautiful countryside in the process. On the bright side, as a result of all the training, he now knows exactly how much it costs to run the practice on an hourly basis and how much he has to earn to cover his debts. 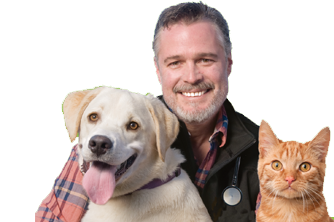 And, while it was important for him to remain hands-on in the rebranded as the Healthy Pets Veterinary Clinic, it was equally important for him to nurture the more lucrative Vets All Natural business and reassess his role in it. When it came to marketing Bruce sponsored many cat and dog shows and, in the early days, spent a good deal of time on the lecture circuit, talking to fellow vets, animal breeders and owners. ‘We targeted the key influencers and developed some core believers,’ he explains, and it worked beautifully. He recalls that once a dog owner drove all the way to the Castlemaine practice from Melbourne after a passer-by noticed her dog scratching and recommended that they google Vets All Natural and go see Dr Bruce Syme! The irony of being successful is that your competitors quickly follow. ‘For the first 15 years of my business I spent more time convincing people that raw food is an option; now it is about which brand is best,’ says Bruce. All along he has paid attention to what customers need. Handling raw meat on its own was problematic so a line of dry grain mix products was introduced. New styles of packaging including a peel and serve option also helped keep Vets All Natural ahead of its competitors. The dilemma of any business owner and parent is getting the right work-life balance, and on reflection Bruce suspects that he could have done better. Developing new product lines also required big investment. ‘One of the hardest things was letting go and trusting other people,’ he admits; however there have been many advantages. ‘I was able to pull back from the marketing which I wasn’t very good at and focus on the science.’ He also drives a lot less miles and can spend three quality days a week in his veterinary practice where it is important that he has a presence. Finally, Bruce has hit his perfect work-life balance. Dr Bruce Syme outside his veterinary clinic in Castlemaine, central Victoria. Choose something that you enjoy. Do your homework and understand that the environment rapidly changes. Don’t become blind to something you are passionate about. If you have a great idea, challenge it and get other people to challenge it as well. Get advice from people who know what they are doing.